The predominant perception of foreign degrees as the key to professional riches has caused the number of enterprising Indians who pursue their undergraduate education overseas to rise annually. As reputed as some colleges may be, the Indian education system has failed to cater to its students who are crucial to developing India as a global force to reckon with. In 1867, Dadabhai Naoroji coined the phrase “drain theory”. In the broadest sense, it referred to how colonists like the British Empire utilized their state apparatus to strip subjugated nations, like India, of their resources. More than a century later, the popular phrase was aptly re-christened to “brain drain”; this represented the overwhelming number of educated Indians who were migrating overseas. Sick of stagnant domestic economies and interfering governments, citizens of developing countries like India were enticed by the opportunities offered by the more developed nations. The idea of settling abroad was so alluring that many Indians began to see it as something euphoric: the ‘Great Indian Dream’ if you will. Although the means of realising this dream may have varied, the most common gateway was to acquire a foreign education. For Indians who could afford it, the go-to life trajectory became the pursuit of an Indian undergraduate education which is followed by a postgraduate degree overseas. It made financial sense for families who could not afford two degrees overseas while allowing their children to have some foothold in India should they ever return. Like many upper-middle-class Indian students, I too was brought up on the same staple diet of wisdom: “UG here, PG there”. Increasingly, affluent Indians are beginning to send their children abroad for an undergraduate education as well. With families now spending well over a crore for an undergraduate education overseas, it seems that the traditional “UG here, PG there” chant is long gone. While the brain drain is risky for India’s future, it forces us to ask our ourselves where the Indian education system has fallen short. 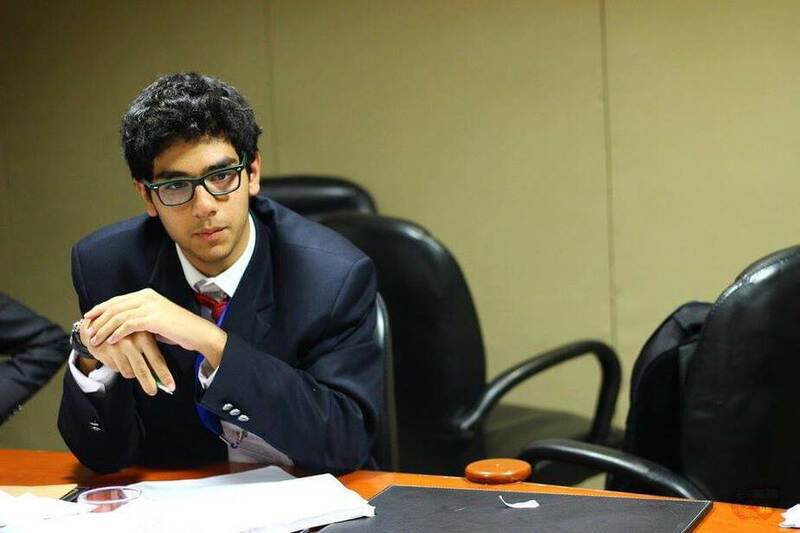 Where are India’s Young Minds? Surprisingly, the massive flock of migrating students are not securing admissions in prestigious legacy universities like Harvard, Oxford and the like, but “second-tier” universities like Drexel in the US, Warwick in U.K. and University of British Columbia in Canada. While I may use the term “second-tier” to describe them, universities like University of British Columbia and Warwick consistently make it to the top of the global rankings. In the latest QS World University Rankings 2019, UBC was ranked 47th in the world, while Warwick ranked 54th. 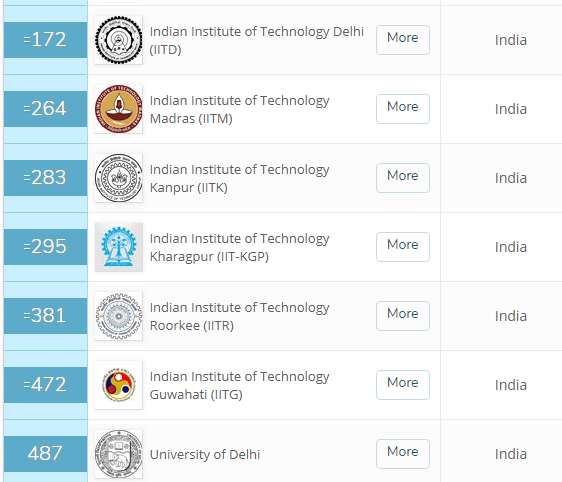 By contrast, India’s highest ranked university, IIT Mumbai comes in at 162nd and Delhi University at 487th. Indeed, while rankings tend to evaluate universities based on parameters — that may not necessarily matter to students — like international faculty ratios and research output, the harsh reality is that even the second rung of U.K. and US universities are considered far better than some of India’s best. The reasons for the shift towards such universities are multifold. The first and most obvious reason is, that top universities in any country, be it Lady Shri Ram College or the IITs in India, or Ox-bridge in the U.K., are notorious for having an admission process difficult to crack. Adding to this, only a small number of students from an overwhelmingly large pool of applications, manage to secure admission into India’s top universities. Last year, St. Stephens college alone received 24,168 applications for 410 seats across 11 courses. The limited availability of seats across the top universities forces Indian students to seek admission opportunities abroad. For students who can afford to chase the Great Indian dream, going to one of the “second-tier” universities for an undergraduate degree is a good way to receive a quality education and gain the exposure necessary to live and work abroad early on. While some may justify their decision to look overseas for undergraduate opportunities as their inability to make it in India’s tough education system, there exists a certain wisdom in leaving.Secondly, the international exposure and modern pedagogy that students are exposed to at the undergraduate level make it easier to build international networks and get jobs in various parts of the world. Finally, the curriculum that is followed by universities abroad is periodically updated to ensure that what the students are being taught is up to date and in line with current affairs. In many of India’s premier institutes, with Delhi University being a notable example, labyrinthine bureaucracies and red-tapism have led to severely outdated university curriculums. Bharat Ratna awardee Prof. CNR Rao made headlines by claiming that 90% of our universities have outdated curriculums. In his view, this has consistently held India back from producing world-renowned universities. A major drawback in the Indian education system lies in our failure in building a strong network of first and second tier universities that can cater to the needs of the vast number of annual Indian graduates. Countries like the US, UK, Australia and Japan all possess a network of top universities. Besides the premier institutions, these countries possess a number of second-tier institutions, which include state-schools and private universities where domestic students can receive a quality education without having to leave the country. While leaving the country for a masters degree is certainly common, studying abroad at the undergraduate level is a rarity. India’s efforts to build such a network has been hampered by lax regulations on the quality of new universities. Newspapers are regularly flooded with stories of how new private engineering colleges are churning out masses of unemployable engineers. A recently released National Employability Report found that 47% of Indian undergraduates were unemployable for industry roles. With the Indian Institute of Planning and Management fiasco still fresh in India’s collective memory, new private universities are viewed with a hint of suspicion. India’s private universities are often the best suited in terms of faculty and research output to make it to the top of the global rankings, due to the wealth of resources they can call on through private organisations and individuals. Meanwhile, India’s established universities have long bemoaned the UGC’s level of interference in the operations of institutes. Massive faculty shortages plague even India’s most venerable centres of learning like the IITs, which have a faculty shortage of 34% across the board. Lastly, the inflated cut off percentages at India’s best universities should not be underestimated. When colleges like Shri Ram College of Commerce routinely post cutoffs of 98% and above for their flagship courses, otherwise talented students — who may possess great technical skills but underperform on exam day — find it especially difficult to secure admission to Indian colleges. The Government as a Solution? Indian philanthropists and businessmen have tried to fill the void in the Indian education system by setting up new private universities like Ashoka University, FLAME and Shiv Nadar University. These institutions aim to provide an educational experience comparable to universities abroad at a fraction of the cost. However, stringent rules and regulations from the UGC have hampered the smooth functioning of such universities. The government hasn’t been entirely asleep at the wheel either. By this year, the government intends to identify and encourage 20 “institutes of eminence”, (10 government and 10 private), which, it is hoped, will represent India’s best chance of breaking into the global top 100. More government interest may be crucial in putting our educational infrastructure on the world map if the Chinese and Hong Kong models are anything to go by. Via their Project 985, the Chinese government aims at propelling their universities to the top of the global rankings by establishing its own C9 league of elite universities. For the last two decades, government-funded financial assistance has been provided to these universities. Determined not to be left behind, Hong Kong’s government founded the Hong Kong University of Science and Technology in 1991. Both countries’ efforts seemed to be paying off; within just 20 years, China’s Tsinghua University and HKUST have managed to surpass several established universities at home and abroad. And while establishing quality institutions may be the need of the hour, a plan for the future must prioritise building an ecosystem that is more alluring to international students. Here again, China’s Tsinghua University established the Schwarzman Scholarship in 2016 for international students in an attempt to replicate Oxford’s highly prestigious Rhodes scholarship. Whether it will succeed in its international endeavours remains to be seen, but one must acknowledge China’s vision and sense of purpose that India has been found lacking in. 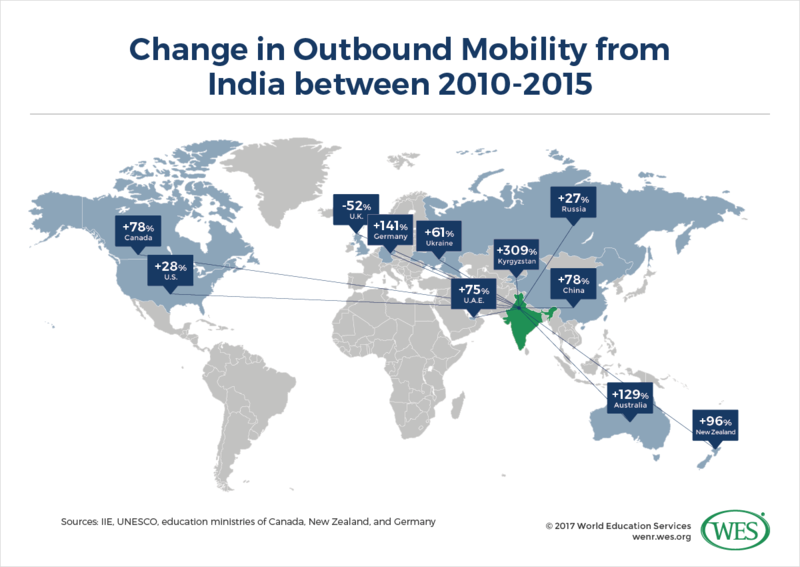 India stands to lose many more young minds if current student migration trends continue. For a nation with high ambitions for the world stage, the loss of highly educated and youthful talent to its international competitors is worth prioritising. As China and Hong Kong have done, India’s education system needs to find its balance between private universities and government support. Until such time, the Great Indian dream will live on.